With the holiday season fast approaching, you may have to travel to visit family. If you’re a dog owner, this is no small task as you have to consider what to do with your dog. You need to consider the personality and temper of your dog, how you are traveling, the conditions of where you’re going to be staying, and how your dog will feel about being in a new place. For some dog owners it might be super easy to pack up your dog and bring them along on your road trip, but for other dog owners, you might want to think about contacting an overnight pet sitting company to book a dog sitter instead. Road trips can be very stressful for some dogs and cause them a lot of unnecessary anxiety and some can even suffer from car sickness. Letting your dog stay at home might be the best decision for them. If you choose to go with an overnight pet sitting company, you have three options: have the dog sitter stop by throughout the day, have the dog sitter stay the night at your house, or have your dog stay at the dog sitter’s house. Whichever option you choose will depend on how long you’ll be out of town and what kind of care your dog needs. In most cases, if you’re going on vacation for the holiday’s, the best option is to book a dog sitter for overnight pet sitting to make sure that your dog has the attention, love, and care they need. 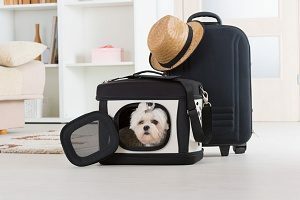 If you choose to take your dog with you while you travel instead of an overnight pet sitting company, there are several tips below that can help ensure the trip is successful for both you and your dog. When you’re planning your road trip it’s very important to make sure that your route is dog-friendly. One of the major components of this is making sure that you’re able to find plenty of rest stops or other locations where your dog can go to the bathroom, stretch their legs, and play. 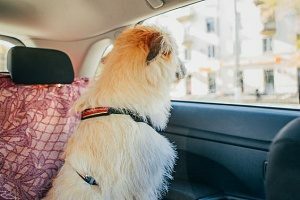 If you know your dog is particularly nervous or anxious during car rides, or they’ve never been on a long car ride before, it’s a good idea to take them on practice trips. These should be short trips that gradually get longer so that your dog is able to become accustomed and feel safe riding in a car. With the holiday season approaching, it can be difficult for you to find the time to take these practice trips. To help you with this, you can hire Paw Pals taxi service. They can safely transport your dog to anywhere they need to go, including the vet and groomers. Your pet sitter will be experienced and able to provide your dog with positive reassurance and loving attention. This can be a great way to help your dog get used to riding in a car. Just as you wear a seatbelt and put small children in a car seat, you need to think about the safest way to transport your dog in a vehicle. It’s recommended that you use a sling or hammock in your back seat to create a safe and comfortable space for your dog. You can purchase dog car seat covers that come in a hammock style that will keep your dog protected, while also making sure they don’t fall off the back seat. If you have a larger dog, you might want to think about putting them in a large crate in an SUV to make traveling safer for them. Before you leave for your road trip, it’s a good idea to get all of your dog’s excess energy out. This will help them to feel calm and relaxed during the journey and may actually allow them to sleep through some of the trip. You can do this by taking them on a long walk or playing with them intensely. It’s recommended that you stop every 2-3 hours when traveling with your dog to allow them to go to the bathroom and to give them a break from sitting in the car. You can use this break to give your dog love and attention to ease any of their nerves, and you can take them on a long walk to burn off an energy they may have regained. When taking your dog to a new, unfamiliar place for them it can be very easy for them to get lost. You should have a recent photo of them with you so that you can show people in an attempt to find your missing dog. It’s better to be prepared and not need it, than finding yourself in a situation where you can’t locate your dog.